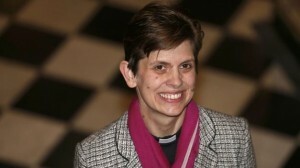 Downing Street have today (17th December 2014) announced that the new Bishop of Stockport – and the first woman bishop in the Church of England – will be the Revd Libby Lane, currently Vicar of St Peter’s, Hale, and St Elizabeth’s, Ashley. As Bishop of Stockport she will serve as a suffragan (assistant) bishop in the Diocese of Chester. She will be consecrated as the 8th Bishop of Stockport at a ceremony at York Minster on Monday 26 January 2015. Speaking at Stockport town hall where she was announced as the new Bishop of Stockport Libby Lane said: “I am grateful for, though somewhat daunted by, the confidence placed in me by the Diocese of Chester. This is unexpected and very exciting. On this historic day as the Church of England announces the first woman nominated to be Bishop, I am very conscious of all those who have gone before me, women and men, who for decades have looked forward to this moment. But most of all I am thankful to God.